The U.S. Federal Communications Commission on Tuesday released a broadband speed test tool for iOS that not only provides instant feedback on current network health, but also aggregates anonymized speed and location data to maintain a nationwide performance map. As part of its Measuring Broadband America initiative, the FCC rolled out its FCC Speed Test tool to create a map of nationwide broadband speeds. The app was first launched on Android last fall, reports re/code. In the effort to map out the nation's network speeds, the FCC says no unique or persistent identifiers will be associated with collected data. Cell tower identifiers, GPS location data and other "passive" metrics will, however, be stored in the sandboxed app for user review. Along with the network health information, the anonymous data is intermittently uploaded to the FCC's servers for aggregation. The iOS version operates in much the same manner as its Android counterpart in offering tests for download/upload speeds, network latency and packet loss. Historical speed data and real-time performance can also be accessed via the spartan user interface. Most of the app's features can be found in established third-party software like Ookla's popular Speedtest.net Mobile Speed Test, but unlike the FCC's software, those options are usually ad-supported. 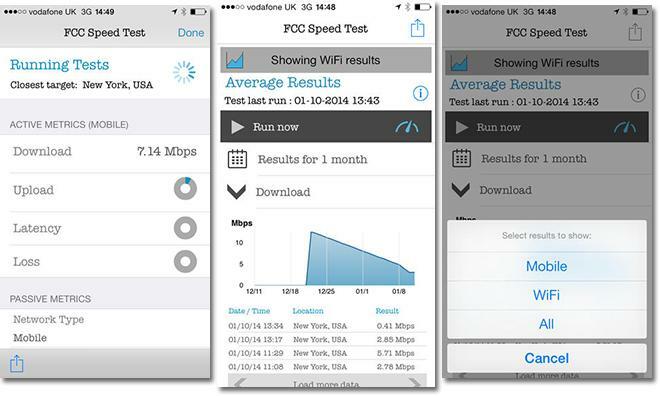 The FCC Speed Test app is a free 2.8MB download from the App Store. Users concerned over privacy issues can delete the app and its associated data at any time.